Durham, NC, February 06, 2018 --(PR.com)-- Organizations can save money while getting speedy big data analytics for marketing campaigns, product improvement, or operational efficiency. 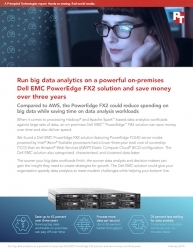 Principled Technologies (PT) compared an on-premises Dell EMC PowerEdge FX2 solution featuring PowerEdge FC640 server nodes powered by Intel Xeon Scalable processors to an Amazon Web Services (AWS) Elastic Compute Cloud (EC2) configuration. The Dell EMC solution had a lower three-year total cost of ownership and categorized, characterized, and clustered data faster.